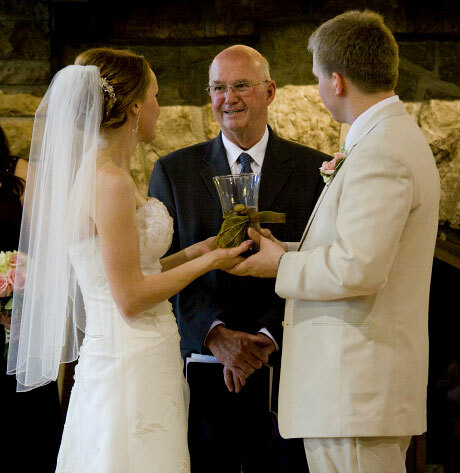 At Jackie and James’ ceremony on Sunday, June 7 at Starved Rock State Park in Utica, Illinois, the sounds of the ceremony were just as moving and present as any other part of the well-thought-out day. 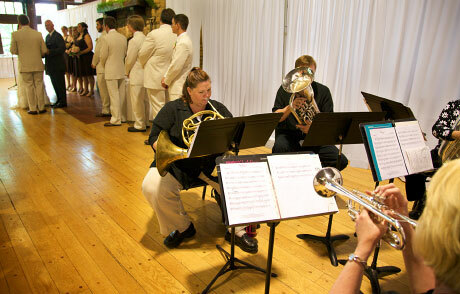 Music is always a consideration when planning your ceremony. Because Jackie and James’ location was not a church, a little bit more thought had to be put into the source of the music, since there was no piano or organ available. They chose The Naperville Brass, which consisted of 2 trumpets, a horn, a euphonium and a tuba. The sound was rich and unique and reverberated beautifully off of the wooden ceiling beams and the wooden floors of the 70+ year-old lodge. An unplanned source of unique sound was the items used in their unity ceremony. Instead of a unity candle or sand or salt, the couple had small, smooth stones distributed to each person in the congregation. 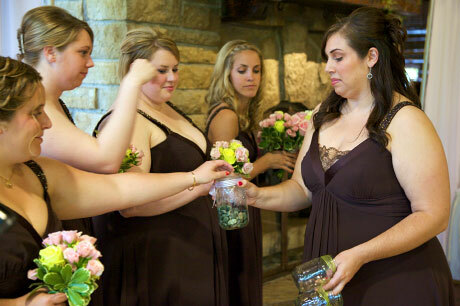 When each person had a stone, they were instructed to hold it and think positive thoughts/pray for the new couple. The stones were then collected. Jackie held a jar of the stones collected from her side and James from his. They then poured the contents of their jars into a common vessel held by the pastor. The sounds made by the stones during this ceremony were fantastic! First, each person taking the stones from the jar, some people accidently dropping them on the wooden floor; each person returning their stone to the glass jar; combining each rows’ jars of stones into 2 jars, two jars being poured into one. I hope every time Jackie and James hear stone against glass, they will think of their wedding day and all of the good wishes and love those “tinks” represent.